Unraveling rustic vanities in search of the perfect rustic bathroom vanity for you. In short, perfect is in the eye of the beholder. With the trend of adding nature and natural wood into our everyday life. So what better way than a natural wood vanity and or burl wood mirror. Commonly we think of a bathroom vanity as a cabinet with drawers. 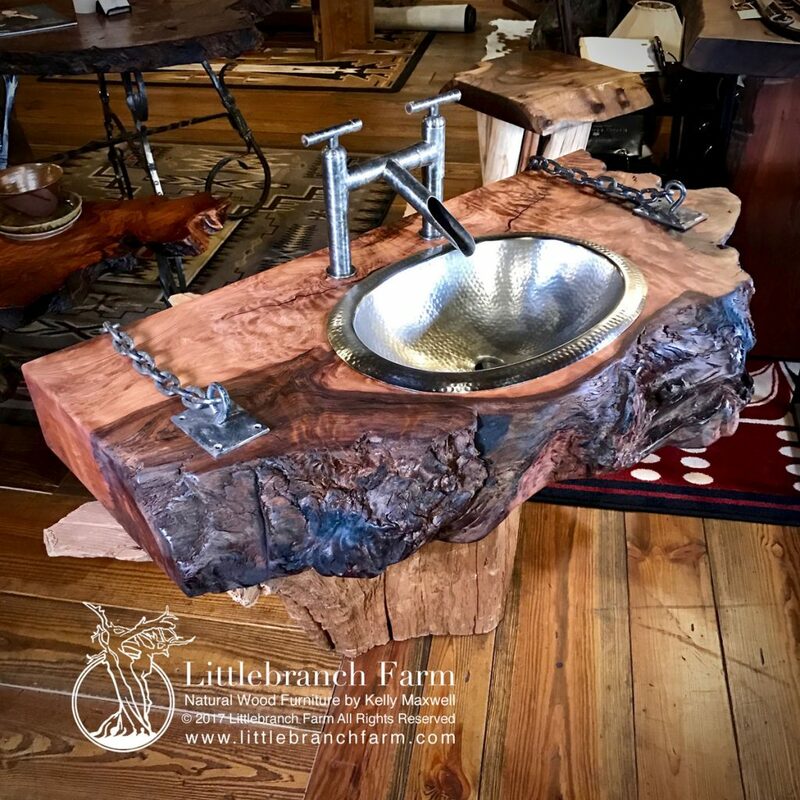 This style of wood vanity commonly trimmed with logs or reclaimed barn wood. However, this is not the case anymore. 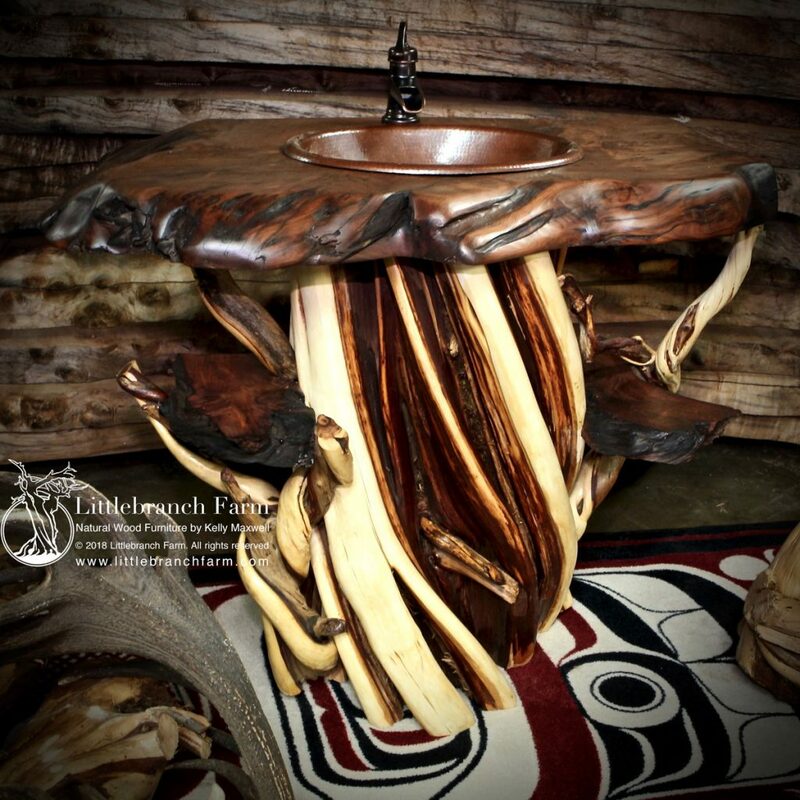 Rustic furniture maker and DIY woodworkers turn to natural wood such as driftwood, logs, stumps, and live edge wood. 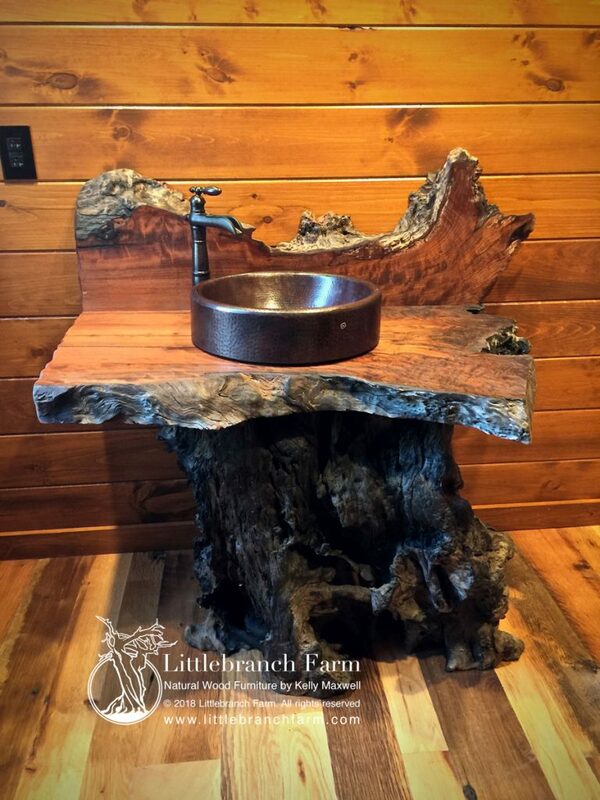 This western cedar log rustic vanity features a tree stump base. Also, shown is an old growth redwood wood countertop with natural live edge wood. The hammered copper sink is paired with a water bridge faucet by Sonoma Forge. One of a kind wood slab hanging vanity with hammered pewter sink. Also, featured is a Sonoma Forge Waterbridge faucet. 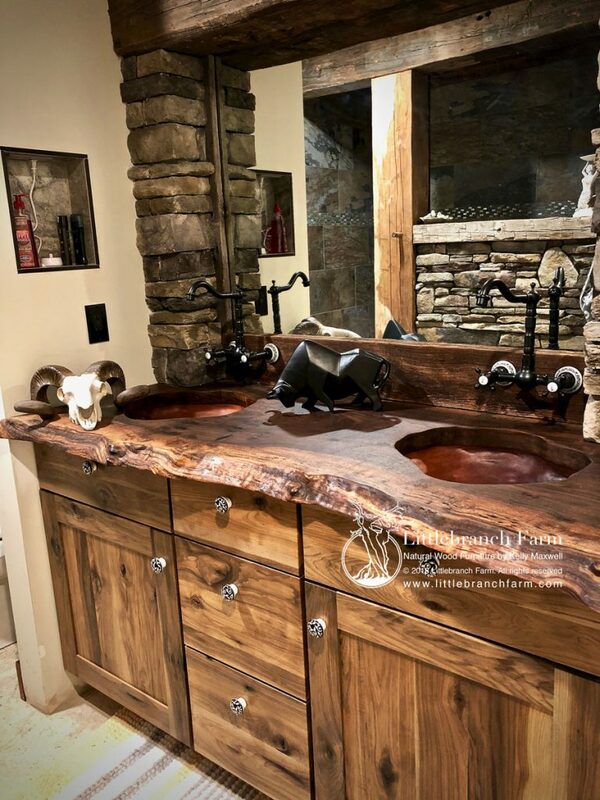 Custom waterfall live edge vanity handcrafted from a rare cluster burl Claro walnut wood slab. With the stress of day to day life creating a calm, stable, and relaxing home decor is a must. And what better than the bathroom as we start and end our day in this room. The drab mundane given way to a zen spa bathroom decor. Along with this, the open clean concepts bathroom vanities are being introduced were once cluttery cabinets stood. With this rustic vanities have grown in popularity. Nothing compares with the calming effect of real natural wood furniture. So how to choose that perfect spa bathroom vanity. First, we need to determine open shelf storage or does a closed cabinet fit your fancy. Also, does clean lines fit your style or does a tree stump, driftwood, or log match your style? Let’s explore the options allowing you to make an informed desition. A natural sand stone sink paired with a curly redwood countertop. This rustic bathroom decor shows off a custom bathroom vanity made from juniper, redwood, and barn wood. Also, shown is a redwood burl rustic mirror and a hammered copper vessel sink. Whether farmhouse, contemporary, or rustic we have a bathroom design that will satisfy any craving. 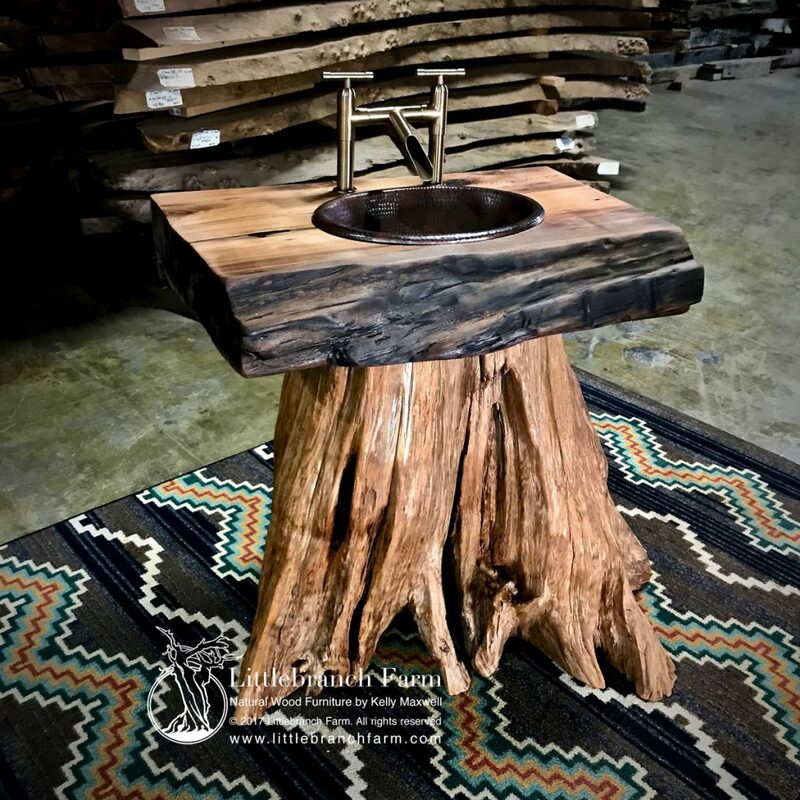 One of the most popular spa style rustic vanity is built from salvaged tree trunks or roots. This style is very organic and natural as you bring nature into the bathroom decor. This is a great DIY project but it is important to use dry wood that has also been treated for bugs. Also, not all wood species are great for this style. Salvaged woods such as old growth redwood, western cedar, and red cedar area the top chooses. Whether you build the project yourself or working with a professional rustic furniture maker the options are limitless. A stump or tree vanity along with log vanity is perfect for a small powder room or half bath. 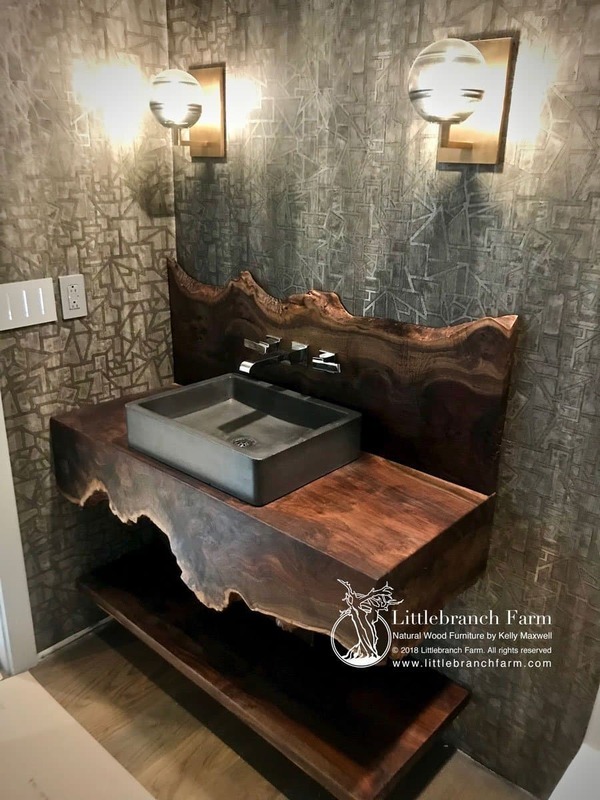 Custom hanging wood slab vanity features a Sonoma forge faucet and pewter sink in a curly redwood wood slab. Along with the log vanity, the hanging wood slab vanity is growing in popularity. Also, known as a floating vanity. Floating vanities look as though they are floating in the air. Eather built from a solid live edge wood slab or in a traditional cabinet. Both are functional so basically, it boils down to personal preference. 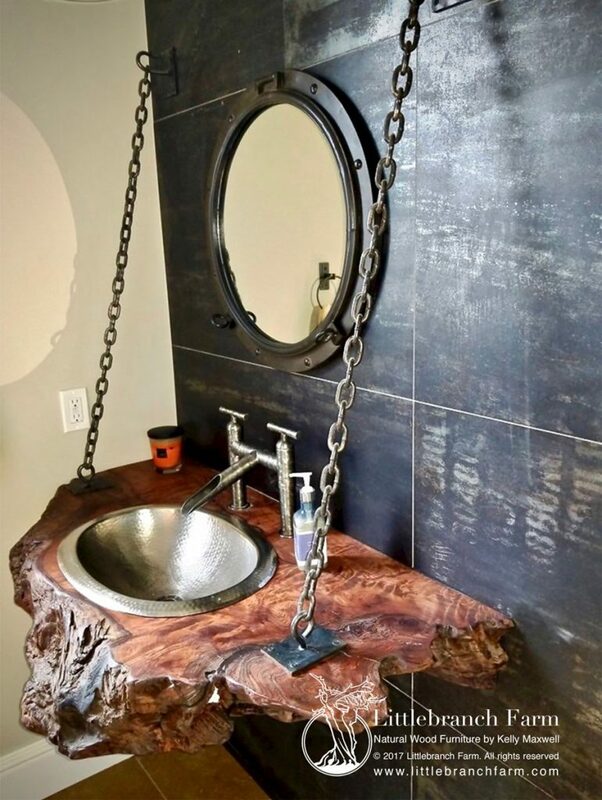 The live edge wood with its versatile design options such as adding hand forged chains is breathtaking. Hammered copper sinks along with stone vessel sinks are extremely popular. Also, carved wood sink have grown in popularity whether stand-alone or carved into the wood slab. Although wood bathroom sinks can have there own set of issues. 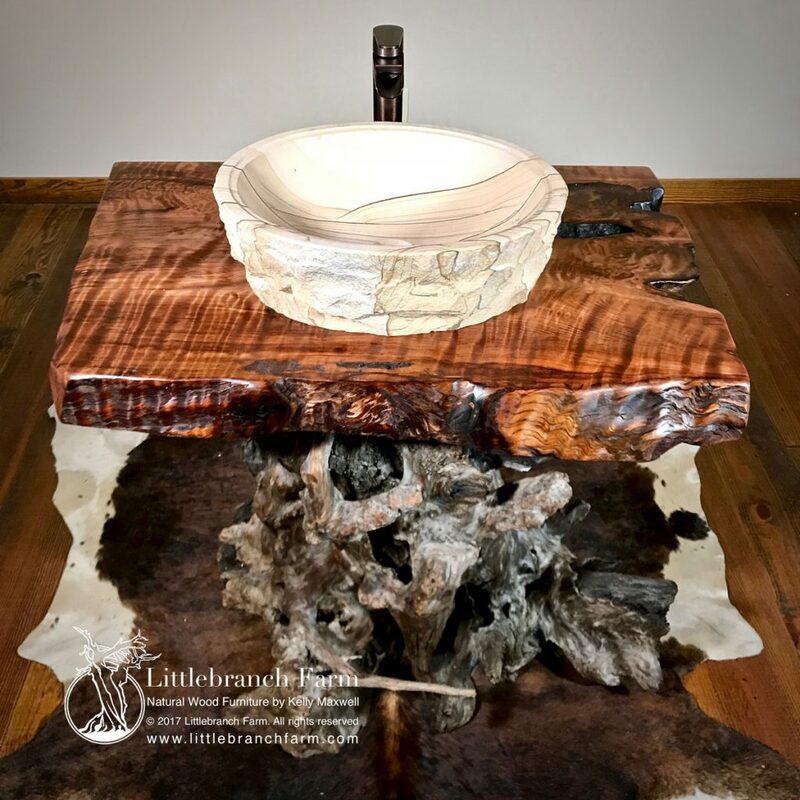 Wood slab juniper log vanity brings out the natural wood beauty of both the juniper and old growth redwood burl. Each piece is built to meet our clients natural wood furniture needs. 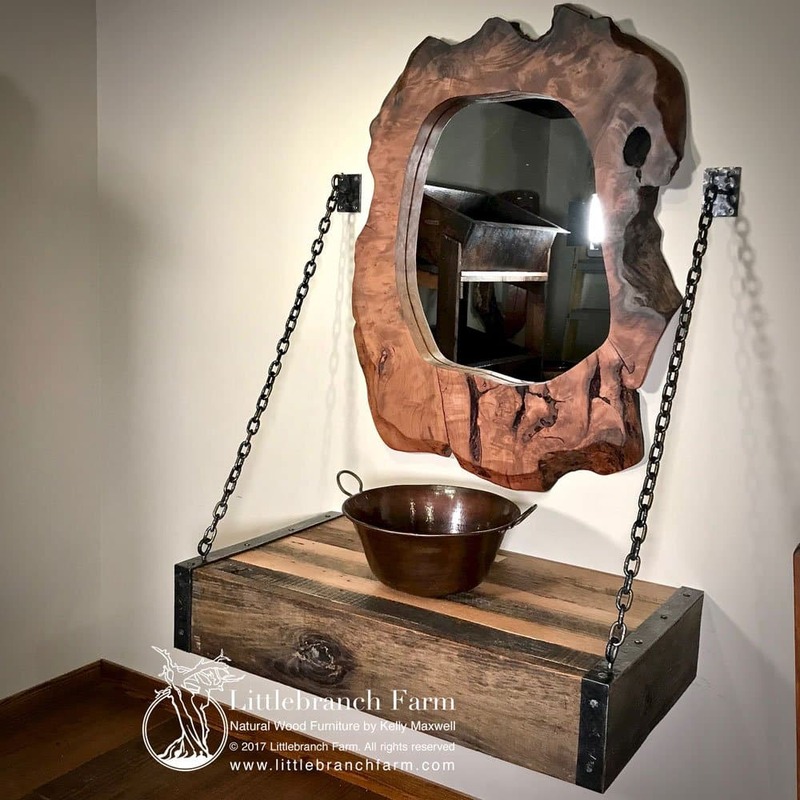 The redwood burl mirror is featured with this floating reclaimed barn wood vanity. Maybe the perfect natural wood bathroom vanity is custom designed and crafted to meet your needs. 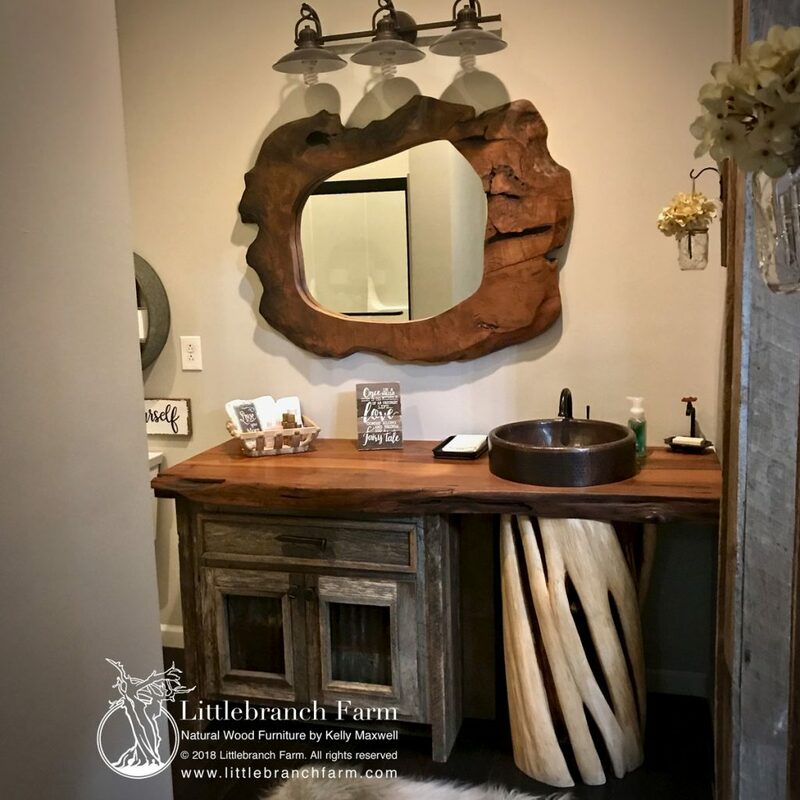 Over the past several years we have worked closely with our client to design and craft the perfect rustic bathroom vanity. Whether a lady lair spa bathroom a man cave bathroom or a rustic theme we are up for the challenge. No project is too small or too big as we specialize in custom rustic furniture. We also work with DIY woodworkers and other furniture makers by providing quality air dried and treated material. 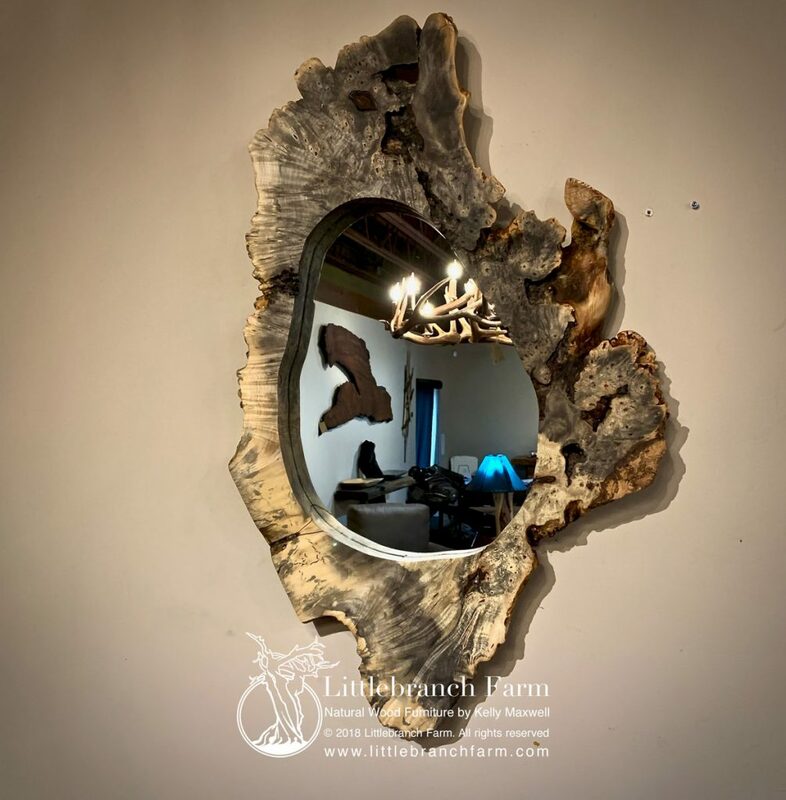 Natural wood slab mirror shows the rich complexity of buckeye burl.